Sharp has announced it has developed a solar cell that has hit the world conversion efficiency record of 43.5%. The record was confirmed by the Fraunhofer Institute for Solar Energy in Germany. The very same number was achieved by U.S. solar company Solar Junction last year, so this matching of the record by Sharp means the race is really on. While quite a few solar efficiency records have been broken in recent years as the march toward inevitable grid parity continues unabated, this 43.5% efficiency record by two companies now is a pretty big leap from the previous record of 36.9%. That highly significant 50% efficiency mark is now shining on the near horizon, so to speak. 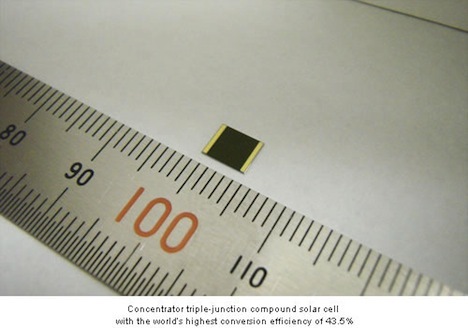 According to Sharp, this record was achieved at the research level using concentrator triple–junction compound solar cells. These particular cells use a lens–based system that focuses light on the cells in order to generate electricity. Because of its high conversion efficiency, this kind of compound solar cell has previoulsy been used mainly on orbiting satellites, but the company says it hopes to apply this latest innovation to photovoltaic systems that can efficiently generate power on Earth, using small solar cells. Solar panels currently available to buy have a much lower efficiency, generally from 15–20%, but every new efficiency record broken should eventually contribute to greater efficiency for the end buyer. It’s certainly going to get very interesting when solar cell efficiency reaches that 50% mark. Do you think that one day we can buy 44% cell ??? ?